Does Betances project as a future SP or RP to you? John Manuel: Really tough question; easier answer is always reliever. I always thought Chamberlain and Hughes would be starters, and here are the Yankees starting AJ Burnett tonight after using Freddy Garcia in this series. I think Betances deserves a lot of credit for making adjustments as he's gone up the ladder and becoming more of a strike-thrower despite a tough delivery to repeat and such a big body to control. His walk rate was much higher this year as he faced tougher competition, and he's going to go to Triple-A next year to see if he can improve that and throw more strikes. With his stuff, he just needs solid control; he doesn't need fine command. The odds are against him being a starter long-term in that organization, but I admit I've become a bit of a Betances guy over the years. His stuff is just so loud. Has the shiny tool-box that is Melky Mesa finally lost enough of his sheen that he can be considered a non-prospect unless he suddenly learns some plate discipline over the winter? John Manuel: Not a non-prospect yet but certainly has lost some sheen. You'd trade plate discipline for power with a guy like that, it's more likely that he regains some pop, he did have a back injury this year that seemed to affect that aspect of his game. Baseball America’s look at the top 20 prospects in each minor league continued with the Double-A Eastern League today, and three Yankees farmhands made the cut. Manny Banuelos ranked sixth, Dellin Betances was three spots behind him at number nine, and Austin Romine was a little further down at number 17. Bryce Harper and (personal fave) Travis d’Arnaud topped the list. In the subscriber-only scouting reports, John Manuel says Banuelos has “excellent velocity for a lefthander, with his fastball sitting at 90-94 mph and touching 95 with regularity.” His changeup has “sinking, screwball action when it’s on and was often his best secondary pitches.” He can also get whiffs with a power curve. Some managers in the league noted that Banuelos’ fastball command suffered because he overthrew, but others think it was a release point issue. “[Several] observers believed that his delivery will allow him to throw more strikes as he matures,” added Manuel. Betances is referred to as a “physical beast who uses his size to sit at 91-95 mph and reach 97 with his fastball.” The report cites three secondary pitches: a power curve, a high-80′s cutter/slider, and a changeup that has “improved and is an above-average pitch at times.” The problem continues to be command, obviously. Romine is said to have a strong arm and “the hands, athletic ability and agility needed to be a sound receiver.” He’s a streaky hitter, and his batting practice power has yet to consistently show up in games. The next and last top 20 list of interest to Yankees fans is the Triple-A International League, which will be posted Friday. Jesus Montero will certainly make an appearance somewhere high on the list, and a few of the arms (David Phelps and Adam Warren in particular) could get some love as well. Brandon Laird might even make an appearance. I will not be updating for the next week: Vacation City. 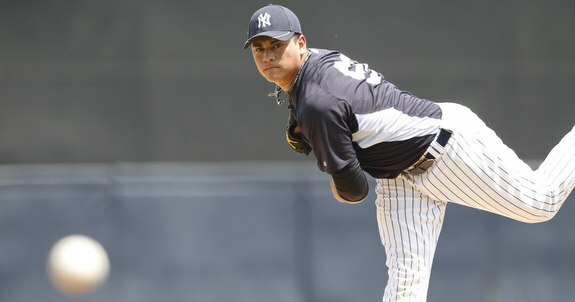 By Mike Axisa Baseball America posted their final Yankees-relevant minor league top 20 today, placing Jesus Montero fifth among all Triple-A International League prospects. Matt Moore, Julio Teheran, Devin Mesoraco, and Desmond Jennings were the four players ahead of Montero. No other Yankees farmhands made the list. With all of Baseball America's League Top 20s now posted, let's tally up the results. The League Top 20 lists can be a good indicator of the strength of teams' systems. It isn't a perfect indicator because it includes some players who have since graduated as prospects and does not include this year's top draft picks that signed late. The leagues aren't all equal, either. A player that narrowly missed the Eastern League list, for example, could very well be more valuable than a player that ranked in the second half of the Pioneer League Top 20. There are also rare instances when key players don't have enough innings or at-bats to qualify for a minor league Top 20 list. Also note that, for this study, players are only listed once (even if they made two lists) and are listed with their current organizations. With all that said, let's look at the results. First, the raw totals. . . But the raw tallies only tell part of the story. While they would look even based on this list, a team would much rather have a group of prospects in Triple-A and Double-A than a group of prospects at the Rookie-level. Here is how the teams stack up when only given credit for prospects in full-season leagues, not including players that graduated from Prospect Handbook eligibility this year (surpassed 130 at-bats as a hitter or 50 innings/30 appearances for a pitcher). . . The Yankees had the fifth-best farm system last year, and the team's top four prospects had productive seasons without graduating. New York also got a breakout season from outfielder Mason Williams, a terrific debut from Dante Bichette Jr. The organization's pitching herd took a bit of a step back this season, but the system is still in good shape. Young draftees: the newest market inefficiency? The big league Yankees are finished, but some of the minor league guys are still playing ball out in the Arizona Fall League. At least one of them could make an impact as early as next season, and the rest are certainly worth keeping in the back of your mind. Winter leagues haven’t started just yet, but the Yankees will have a few more recognizable names playing in places like Venezuela and the Dominican Republic once those leagues get going. For now, these are the Yankees currently playing down in Arizona. This year: Had a 3.19 ERA as a Triple-A starter. Next year: Should be in that mix to be the Yankees sixth starter/long reliever. Of the seven Yankees in the Fall League, Phelps is probably the closest to the big leagues. His season was cut short by injury, so he’s getting a few more innings down in Arizona (a notorious hitters’ league). His first two starts lasted just three innings, but this is more about getting work than getting results. This year: Had a 3.64 ERA between Low-A and High-A. Next year: This was only his first full pro season, so a return to High-A might be out of the question. The thing that stands out to me is the 2.24 groundout-to-flyout ratio this season. He was a 2010 12th-round pick out of St. Johns, and he’s one of several college pitchers from that draft moving quickly through the Yankees system. He’s been a multi-inning guy for the Yankees, and half of his first four Arizona appearances have been more than an inning. Opponents are hitting .346 off him, though. This year: Had a 2.47 ERA with 77 strikeouts and 29 walks between High-A and Double-A. Next year: The Yankees have been aggressive with Whitley, but a return to Double-A seems entirely possible. It will be only his second full season as a pro. Hard to ignore this guy because the Yankees have been so aggressive with him. Yet another college reliever from the 2010 draft, Whitley skipped Charleston, opened this season in Tampa and got to Trenton before the end of June. High-A hitters managed just a .233 average against him, but Double-A batters hit .280. He regularly pitched two-plus innings at a time this season, and through his first 4.1 scoreless innings in Arizona, he’s allowed only a .188 batting average. This year: Had a 3.11 ERA and a .248 opponents batting average out of the Tampa bullpen. Next year: Having skipped Low-A Charleston completely, he could push for a Double-A job. His walk totals rose as he got deeper into the season, but overall, the results were encouraging for Claiborne’s first full season as a pro. He’s another of those college relievers moving quickly since the 2010 draft. He didn’t allow a home run in his last 11 regular season appearances — averaging well over an inning per appearance — but he coughed one up in his first Fall League outing. This year: A typical Joseph-type season in Double-A where he hit .277 with 38 doubles. Next year: In line for a promotion to Triple-A and the possibility of serving a big league utility role in the near future. Reminds me of Kevin Russo, maybe with a little more pop. Joseph can play second and third, he could probably handle the outfield if necessary, and my guess is he could play a passable shortstop in an emergency. He’s never put up overwhelming numbers, but he’s a steady hitter with a career .284/.363/.418 slash line (Russo hit .287/.348/.382 in the minors). Joseph might not be a star, but he could hit enough to play a role, kind of like Russo did for a little while in 2010. He’s started hitting again after a fairly slow start in Arizona. This year: Playing second, third and all three outfield spots while hitting .333/.378/.524 in High-A Tampa. Next year: He’s already 27, so the Yankees could get aggressive and push Mustelier to Double-A after just 31 High-A games. A Cuban defector, Mustelier primarily played the outfield corners, but he showed plenty of defensive flexibility and an intriguing bat. It’s easy to see why the Yankees sent him to Arizona. He’s really something of a wild card in the organization. Kind of like when Juan Miranda came over, Mustelier hasn’t played much the past two years. This year: In his first full season, hit .287 with seven home runs and 55 RBI between Low-A and High-A. Next year: His slow second half suggests a return to Tampa at least to start the year. Primarily a third baseman, Segedin has started to see time at the outfield corners to increase his versatility. He raked in Low-A Charleston, but hit just .245/.311/.309 after a midseason promotion to High-A Tampa. He’s gotten off to a similarly slow start in Arizona (.227/.346/.273 through his first six games, five of which were spent in the outfield). He was a third-round pick in 2010, so he’s still fairly new to pro ball, and obviously still fairly highly touted. He just hit his first Arizona home run on Friday. As you probably know, during the offseason I like to focus on the minor league system every now and then. Today I was looking through milb.com’s end-of-the-season awards, searching for nominated Yankees. There are only a handful, none of them coming from the upper levels, but this small collection might put a few unfamiliar names on your radar. If you’re interested, you can vote on these awards through Thursday. Go here to vote for the 2011 MiLBY Awards. Second in the New York-Penn League with a .349 average, Williams also led the league with 29 stolen bases and finished top 10 in hits, runs, total bases, triples and on-base percentage. Williams was a fourth-round pick in 2010, and he’s quickly emerging as one of the most interesting players in the lower levels of the Yankees system. His athleticism has never been questioned, and this season he turned that talent into baseball results. With Slade Heathcott battling injuries and Melky Mesa struggling after last year’s breakout season, Williams might be developing into the Yankees top center field prospect. Maybe you can’t rank him ahead of Heathcott just yet, but a bit year in full-season ball could really solidify his status. Before a late-season promotion to Double-A, Flannery was a dominant late-inning reliever for High-A Tampa. He had 19 saves, a 1.24 ERA and only five walks through 43.2 innings. The numbers were similar to 2010, when Flannery allowed a .207 opponents batting average in Low-A Charleston. He was a 47th-round pick in 2008, so Flannery has never been an elite prospect, but he has a 0.995 career WHIP with a ton of ground balls and very few walks. The past two seasons the Yankees have drafted quite a few college relievers who seem poised to move quickly through the system. This year, Pinder was a 16th-round pick out of Santa Ana, and he was overwhelming in Staten Island. Through 31 innings he allowed just 16 hits — a .152 opponents average — with five walks and a 38 strikeouts. He was second in the New York-Penn League with 14 saves. Full-season ball might be a different challenge next year, but that’s an impressive debut. More of an event than a game, Almonte was singled out for a hitting streak that reached 30 games on August 29. That day he went 2-for-3 with a single and a double. Almonte went on to extend the hitting streak to 34 games before it ended in his next-to-last game of the season. The streak raised his batting average from .235 to .266 and he ended the season at .268 (he had three hits in the finale). The second baseman-turned-center fielder has long been touted for his potential, but he has yet to put up consistent results. Made up mostly of players from the past two drafts — plus some international guys and a few players coming back from injuries — the Staten Island Yankees won the New York-Penn League. They were third in the league in runs scored, second in batting average and first in strikeouts (for the pitching staff). Williams was the star of the show, but hitters like Tyler Austin, Ben Gamel and even Cito Culver — who led the team in RBI despite batting just .250 — had nice seasons, and the pitching staff showed some depth with Pinder in the bullpen and Matthew Tracy serving multiple roles.